All winter (okay, not all winter) I preach my hatred of salads, then come summertime, it’s salad everywhere. 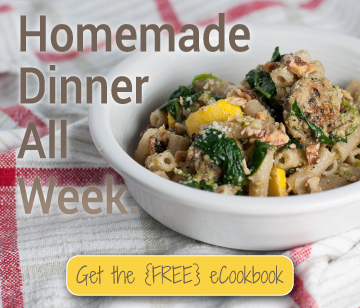 Pasta salad, potato salad, and now? TOMATO salad! Spanish tomato salad to be precise. I know caprese-style summer salads of fresh tomatoes and burrata and a few basil leaves and a little glug of olive oil are all the rage, but they have never been my thing. Slowly growing on me, maybe, but I’ve always found mozzarella in any form much too mild for my taste buds. Plus, when you’re planning dinner around a Spanish theme (that you didn’t tell your guests about), the caprese action isn’t going to work. We must stick to the theme! I realized last week, though, I have no idea if the Spaniards even eat salads. Of course, I turned to my most reliable knowledge source of Spanish cuisine, our local tapas bar, and came to the conclusion that the only salad I’ve ever encountered there is a light plate of crisp baby greens with a few goat cheese fritters. Tasty, yes, but not exactly something to write home (or the internet) about. Really the only viable candidate in my search for a somewhat hearty, somewhat healthy Spanish salad came in the form of BBC good food’s Spanish tomato salad. Other prospects were so grim that I didn’t even balk at the task of converting metric measurements, so you’ll find the Americanized method in today’s recipe. 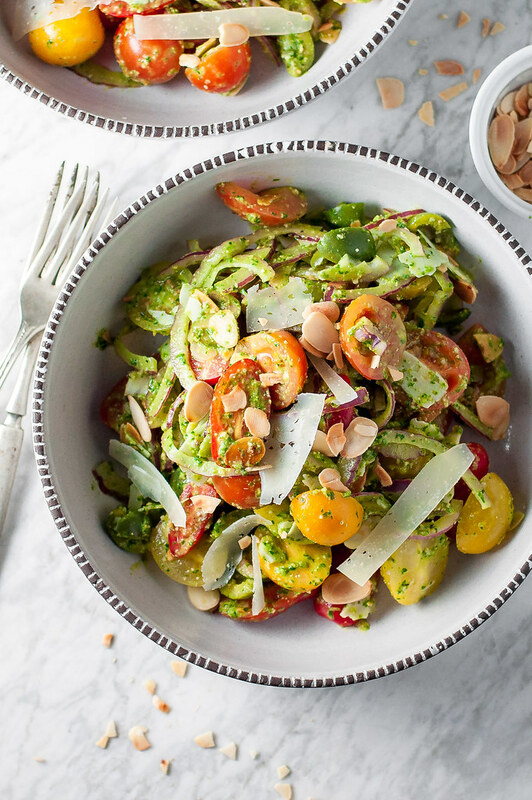 Other than that, the salad is bursting with flavors and textures. It’s the kind of thing you eat where you can’t quite figure out what’s in it, but you don’t exactly care. Avocado? Green tomato? Olive? Two out of three. Instead of cutting ripe tomatoes–which haven’t come into their full glory yet–into big chunks, I found rainbow colored baby tomatoes, which, halved, make an excellent base for the remaining ingredients. Manchego is probably my favorite one on that list, and shaving it into thin slices ensures you’ll get some in every bite. You’re welcome to use your favorite cured meat in the salad, but my guests and I were more than content with the bright, fruity, and plenty salty Castelvetrano olives. They sound fancy, but if you have an antipasto or olive bar at a grocer near you, you can probably locate some–they’re the really pretty bright green ones. If not, I think the whole concoction would be equally delicious with your favorite olives. The whole salad, when tossed, kind of turns into one big juicy mess (the photos were taken immediately after dressing), but I don’t think you’ll mind at all. I certainly haven’t as I hovered and slurped over the dish of leftover salad for two days after the party. Vegetarian/gluten free. 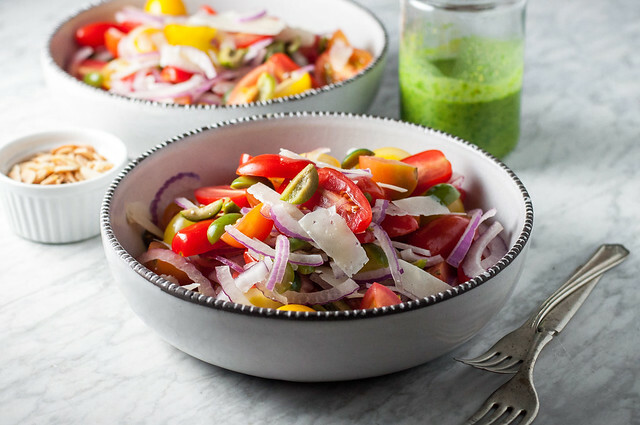 Don't hesitate to make a double batch of this tomato salad, especially if it's warm out. It's pretty and impressive for a crown, or a yummy, refreshing light lunch or dinner to eat all week. If your almonds are raw, heat a dry skillet over medium heat. Add almonds and stir frequently until mostly golden brown, about 5 minutes. Transfer to a plate or towel to cool. Combine vinegar, oil, 3 tablespoons water, honey, garlic, ½ teaspoon salt, a generous pinch of pepper, ¼ cup of the almonds, and the parsley in a blender (or small food processor). Blend until nearly smooth, but with some flecks of parsley still showing. If the dressing isn't fluid enough to pour, add more water 1 tablespoon at a time. Transfer to a container and refrigerate or set aside until needed (the dressing can be made a day ahead; after a day the green color really starts to lose vibrance). If the dressing is still fairly thick, stir in another tablespoon or two of water. 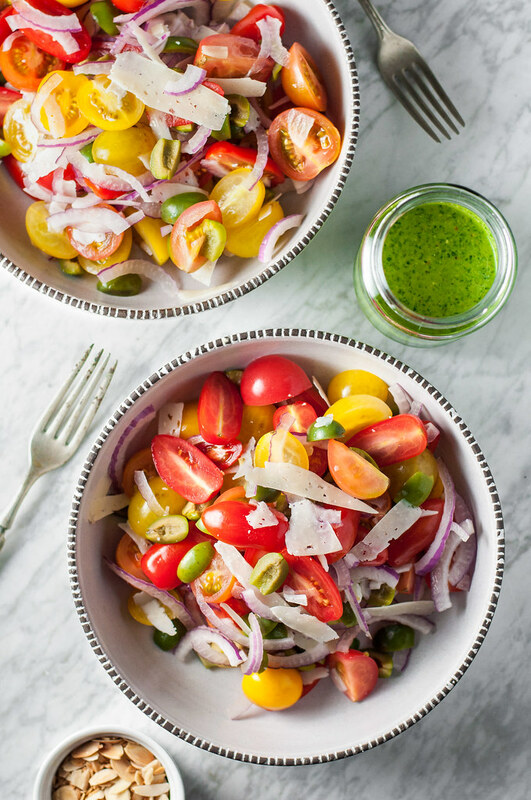 In a large bowl, gently toss tomatoes, onion, olives, and the dressing (start with half if you like to go light on the dressing). Fold in olives, almost all of the almonds, and the cheese. 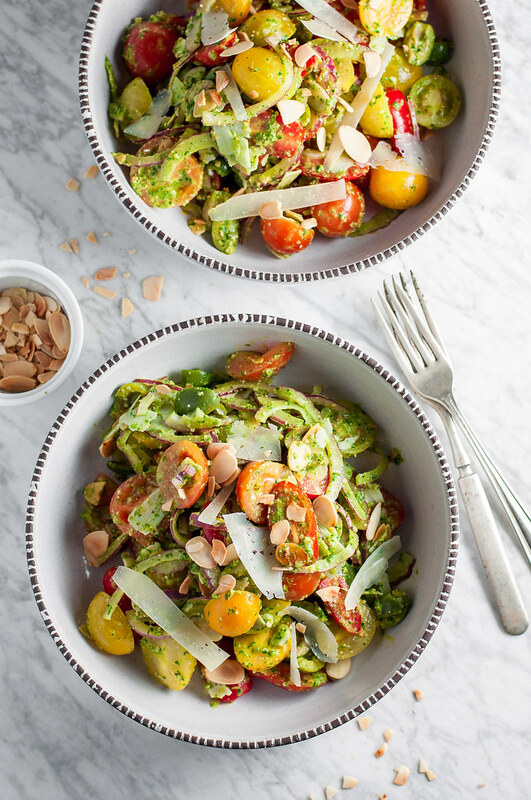 Garnish with remaining almonds for serving, either chilled or near room temperature. You can substitute red wine vinegar for sherry vinegar, but you'll sacrifice a bit of that unique, complex flavor that the sherry vinegar brings. To make the salad vegan, substitute maple syrup for honey and omit the cheese. The salad does well made a day ahead. The tomatoes will start to release their juices, whether you mix in the dressing ahead of time or at the last minute. You may want to wait to mix in the almonds if they will bother you when slightly softened. Note: This page contains affiliate links. It does NOT contain sponsored content. 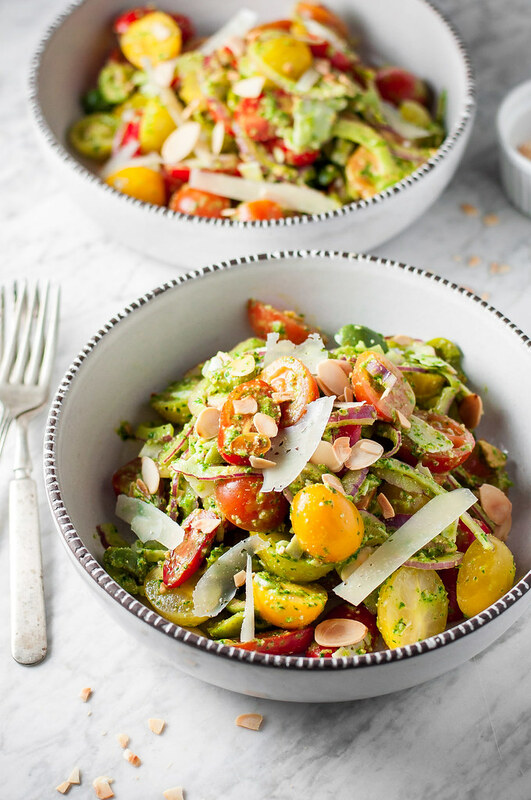 Affiliate links (to products I recommend, on Amazon) offset my ingredient and website maintenance costs, so I can keep bringing you salad recipes like this one. Thanks! Now that’s a salad I can love, even when I’m salad-full. Give me tomato-y tomatoes any way you can, long as they’re ripe and juicy, and I can just taste that dressing on them, along with the cheese and other goodies. Thanks Kathryn! So weird, I have been on the biggest salad kick lately–more to come this week, haha. Sounds like a yummy tomato salad! Maybe I’ll add a little toasted bread cubes to soak up all that juicy goodness! Emily–THAT is an amazing idea! Kind of panzanella-ish. Thanks!